As part of our 4 day press trip with Riviera Maya Tourism, we were offered to stay at the beautiful Hacienda Tres Rios Resort near Playa del Carmen, Mexico. This stunning 326 acre property is actually more of a nature park than it is a resort. As you enter the estate, via a long, jungle clad driveway, the calls of various birds, bugs and reptiles remind you that you truly are in nature when you stay at Tres Rios. 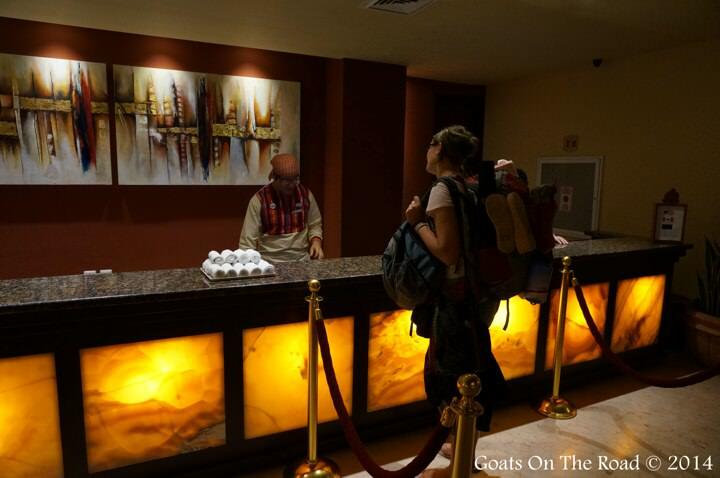 We arrived late at night, but were warmly welcomed by the friendly, efficient staff who greeted us in the enormous lobby. We checked in and were shown to our room. We’ve had the opportunity to stay in some pretty amazing places in our 5 years of travel, but this room was definitely one of the most breathtaking suites we’ve ever placed our bags in. 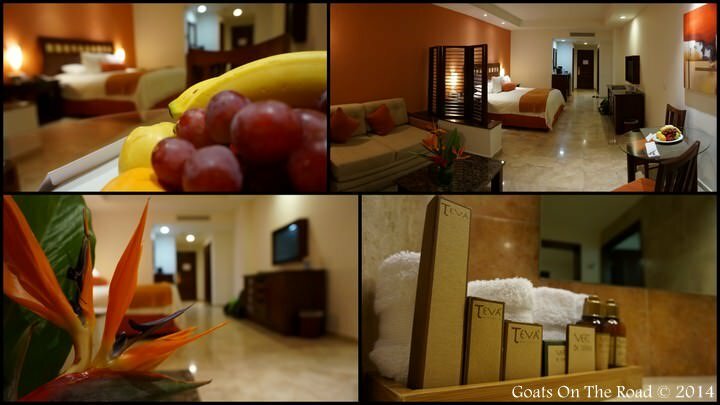 Each of the 273 suites are tastefully furnished using all local materials and artwork. We were in the Mangrove Junior Suite which, at 645 square feet, was large, spacious and remarkably comfortable. The king sized bed was one of the coziest we’ve slept in and we had an excellent sleep that first night. All of the rooms at the resort use a perfectly balanced infusion of modern style and local flare. The Mexican marble floors sparkle and meld seamlessly with the traditional mahogany furniture and granite countertops. Our room had an exquisite view of the mangrove forest and pool below and also came with daily appetizers and refreshments delivered right to our door. Our favourite part was the marble rain shower, which had excellent pressure. The bathroom itself was larger than some hotel rooms we’ve stayed in the past! Look good to you? 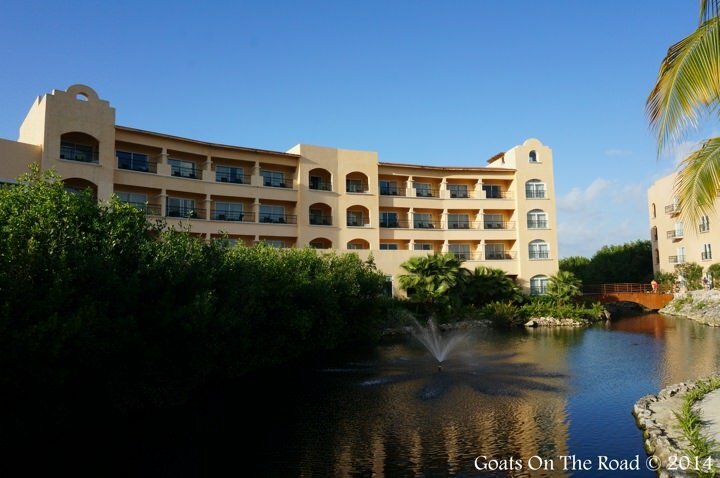 Click here to book your room at Hacienda Tres Rios. We were on the Tres Rios Endless Luxury plan, which gave us free rein at all of the restaurants, buffets and bars at the resort. 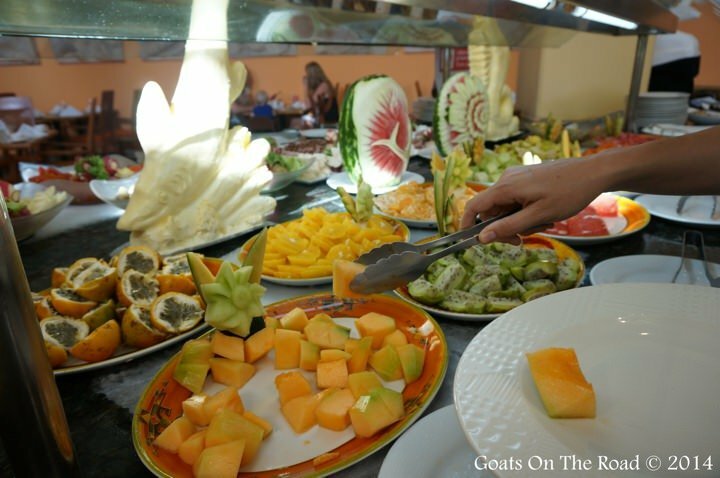 We started each day with the amazingly diverse breakfast buffet which served everything from Mexican Chiliquiles to Spanish-style omelets, fruit platters and american sausage and eggs. We enjoyed lunch at the poolside bar or pizza restaurant, both of which made perfectly mixed Margaritas to wash everything down. For dinner, we chose from one of the 7 other lounges, grills, bars and restaurants on the property. Our favourite was the Asian restaurant which served up simple, but satisfying Asian fusion dishes. The sushi roll appetizer was the best and we probably ordered about 20 of them while we were there! Hacienda Tres Rios treated us to a full day of adventure and we had a blast with their PR reps Paola and Nadia. The day was jam-packed with fun activities. 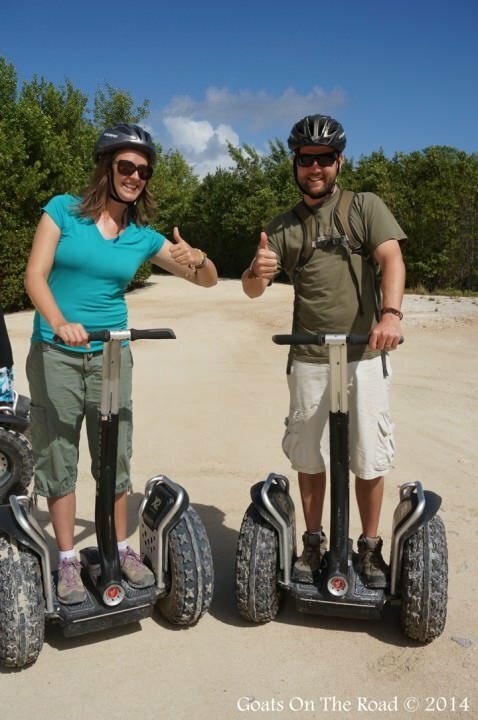 Segway Tour: This was our favourite tour at the resort! Everyone has heard of the Segway right? Well they’re the 2-wheeled, stand up electric vehicle that you always see mall cops riding around on. It turns out, they are endless fun! We ripped around the whole property, through the jungle and mangroves, into the plant nursery and back to the resort. It was definitely a highlight of our stay. We have to buy a couple of these! Sense Adventure Tour: After we finished up on the Segways we headed to the Sense Adventure Tour. This was right up our alley as it was a mix of meditation and concentration on all of the senses. We were blindfolded and led through the jungle. Along the way we were drenched, dried, fanned and fed. We tasted chocolate and were given various herbs and spices to smell. It was very calming and we came out feeling refreshed and renewed. Snorkel Tour: Tres Rios actually means “three rivers” and is so named for the trio of streams that criss-cross the estate. We headed to one of the cenotes, donned our snorkel gear and hopped in. The slow currents gently pulled us down the river away from the cenote and toward the sea as we calmly floated and gazed down at the tangled mangrove roots and the fish which inhabit them. Dinner At The Chef’s Table: When we heard that we were to be served a seven-course meal next to the chef in the Hacienda kitchen, Dariece and I were very much looking forward to it. 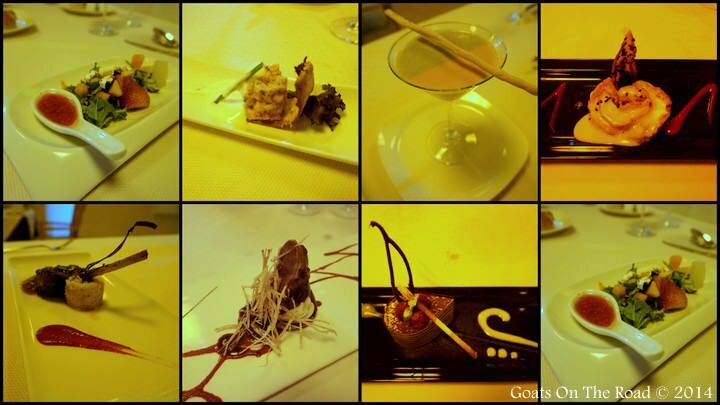 As you know, we love food and this was a true culinary adventure. The meal started with a mixed raspberry vinaigrette salad with blue cheese and mango. We were led through the meal from there and we indulged in succulent salmon, sumptuous soup, Xtabantun shrimp, luscious lamb, and delicious duck. We finished it all off with a chocolate taramasu which was truly divine. The meal was incredible and although the banana doused shrimp seemed a bit pretentious, the rest of the meal combined simple flavours and local produce to create a truly spectacular journey for the pallet. Check Out This Quick Video Of Our Day At Tres Rios! What really set Hacienda Tres Rios apart for us were the grounds on which it was built. The 326 acre nature park faces the sea and is split into three by the slow flowing rivers. The beach out front is absolutely gorgeous with the soft white sand and aquamarine waters that you would expect from the Riviera Maya coast. There are 3 pools at the resort but just one small swimming area reserved for adults only. We found that while we were there, the kids seemed to swim in the reserved pool just as much as the adults, but other than that the pools were large, clean and well-maintained. There are a few paths that meander through the mangroves and are definitely worth exploring, although who wants to walk when you can take a segway? The huge resort building stands like an imposing pastel wall in a semi-circle facing the sea. Although it is huge and doesn’t look very natural in its lush surroundings, the structure itself is well manicured and does a good job of retaining a hacienda-like exterior design. 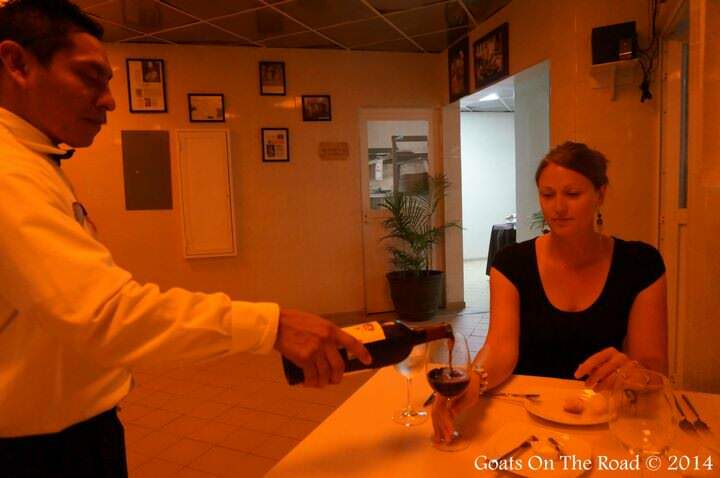 We found that the staff were very helpful while we were staying at Tres Rios. They seemed genuinely friendly and happy to provide their guests with a high level of service that you would expect from a 5 star resort. The true star of the show is the exceedingly charismatic hotel manager, Sammy, who seems to know every guest by name. The staff at Hacienda Tres Rios were great. Very bad internet connection and wi-fi throughout the hotel. An ongoing problem for Tres Rios but if you’re there to relax on a vacation, this shouldn’t be a problem. We were there to work and found it very difficult. Generic alcohol at the bar. Some of the liquor was very nice near the pool and in the sports bar, and although they served up delicious margaritas, much the booze was of a cheap label. Surprising given the level of everything else on the resort. 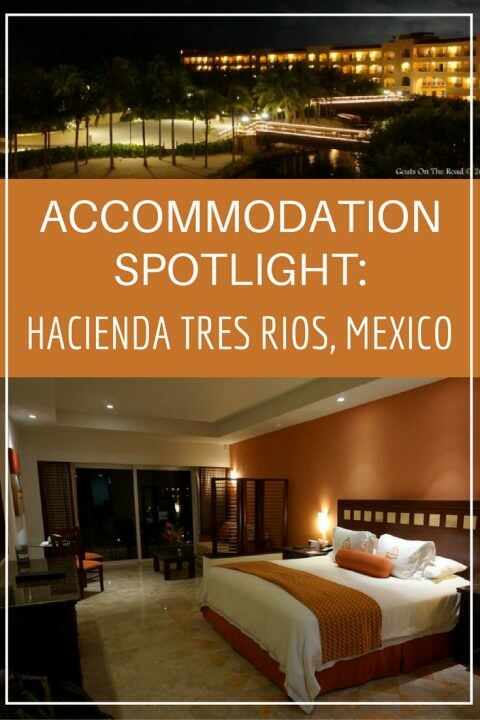 We had an excellent stay at Hacienda Tres Rios. They call their meal plan “Endless Luxury” and really it’s more than just the food and drink that can attest to this name. Guests who stay here will live like kings for the duration of their stay, but they won’t be treated as kings. They will be treated as honoured guests by the gracious staff and friendly service at the resort. We were very happy that we were invited to stay at this beautiful 5 star resort and we hope that one day we can return for another truly luxurious holiday. 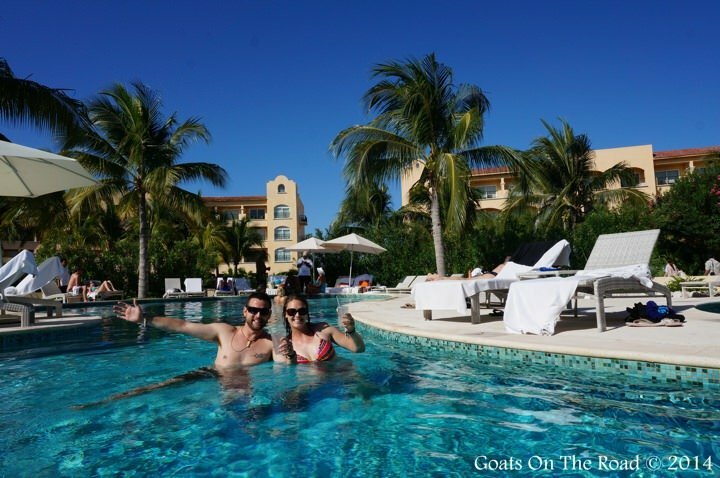 We loved our stay at this resort and are sure you will too! Click here to easily book your room. Thank you to Hacienda Tres Rios for hosting us for 4 nights. As always, all thoughts and opinions remain our own. Looks beautiful! 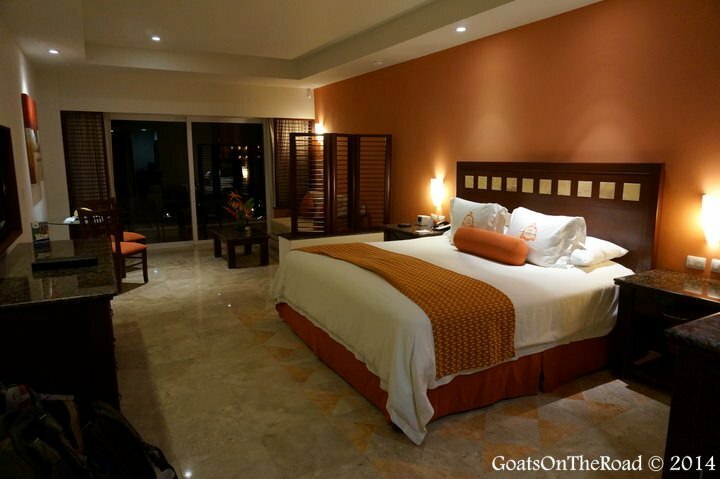 We have stayed at the Grand Velas in Riveria Maya- and have always heard and seen great things about Hacienda Tres Rios– thinking we need to consider this for our fall trip!